In the early 2000s, I was talking with a park ranger at the Grand Canyon. He told me he never really had to help anyone with serious dehydration in the Park. Too much water, leading to a salt deficit, was more common in his experience. Ten years later, I got a copy of this book for free. Timothy Noakes explained, at length, why that park ranger was right. Noakes runs through a massive amount of material relating to human physiology, looking at the biomechanics of running, the hormonal signals that regulate thirst, and all of the associated research. When I first read this book in 2012, I realized I was completely in over my head. I found Noakes' arguments interesting, but I lack subject matter expertise to really be able to assess the details of his arguments. Which is a pity, because I suspect he might have a point, but it is prudent to see what the best counterarguments are, in the best Thomistic fashion. I'm also cautious simply because this is a field with lots of axes to grind. Like Gary Taubes, Noakes is a bit of a contrarian, and in this book he claims that Gatorade is partly responsible for the idea that we need to drink all the time during exercise, in order to maximize revenues. I don't have an opinion on this. I find it possible, at least, but I'm not interested enough to find out whether it is true. And to be fair, Noakes is suspicious of Gatorade because he realized that the free shoes Nike used to send him colored his views on running injuries (p xvi). I also don't think it matters to the core argument of the book. Which is extremely reasonable: only drink when you are thirsty. Even when you run or bike for a really long time. 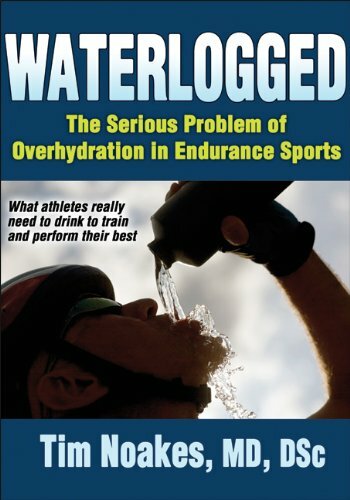 As evidence for this, Noakes can point to historical examples like the early and mid-twentieth century practice of marathon runners to not drink anything during the entire race (pp xiii, 38, 210), or the endurance hunting practiced in places as various as the Kalahari and the American Southwest, where you run an antelope to exhaustion and then kill it easily (p 10). After establishing this recommendation, Noakes looks at the etiology of exercise-associated hyponatremia (EAH) and exercise-associated hyponatremic encephalopathy (EAHE), which he believes are caused by overdrinking during endurance exercise, especially marathon running. Noakes has documented 1600 cases of EAH and EAHE in an Appendix, and he has plotted the incidence over time. 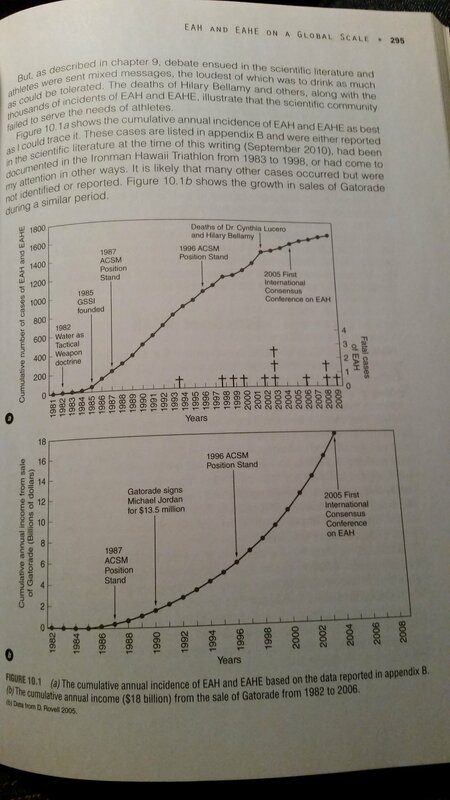 The clear implication of this juxtaposition of charts is that Gatorade is to blame. I'm not sure of this. For example, Noakes doesn't adjust the incidence of EAH and EAHE for the increasing numbers of people participating in endurance sports, which implies a gradual lessening of average fitness, or the numbers of people participating who fall below some threshold of fitness. On the other hand, Noakes does have some evidence that physicians and scientists who got money from Gatorade advocated for the drinking guidelines that he thinks are causing EAH and EAHE in endurance athletes. On the gripping hand, Noakes has some evidence that reducing the availability of fluids during races decreases the incidence of EAH and EAHE (p 303), and that the US military saw a reduction in incidence of both after fluid intake guidelines were changed (p 321). Noakes also mentions the cases of EAH in the American Southwest, specifically the Grand Canyon, citing a 1999 paper (Backer, Shopes, et al 1999), which brings us full circle, to that anonymous park ranger I met a few years later. Despite the criticisms I have made, I think Noakes is on to something. In part, that is because his core recommendation is pretty sensible. But it is also because where he says something that outrages conventional opinion, I have seen something with my own eyes, or heard with my own ears, evidence that supports Noakes. This increases the probability he is right, but it isn't quite definitive evidence. Since this isn't my field, I'll call that close enough.